As a teacher who carries his MacBook Pro and iPad 2 to school each day, finding a decent laptop bag is a real priority for me. Without a doubt, the readers of this article are fans of Apple’s amazing, yet pricey products. Protecting that investment while maintaining functionality is important for people who want to maximize their productivity. I think I’ve finally found my solution after using Level8’s Atlas Backpack and 15″ Protective Sleeve for the past month. Level8 develops their products with a focus upon compatibility with Apple products. In fact, Level8 products can only be purchased in Apple Stores or at Apple.com. Their attention to detail and focus upon matching their bags and sleeves to Apple products is impressive. Level8’s 8 Points of Precise Protection highlights this dedication to quality and functionality. I’ve been using the Atlas Backpack for over a month, carrying assorted papers, a 15″ MacBook Pro, an iPad 2, an iPad Keyboard Dock, various cables, and a myriad of odds and ends back and forth to work each day. In a word, this backpack is amazing. Even after putting it through its paces, every zipper still works ultra-smoothly and not a single stitch has come undone or become loosened. This thing is tough. 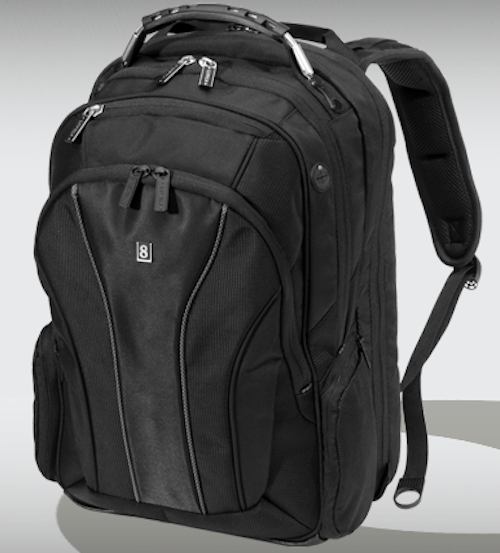 The exterior is heavily padded where it rests against your back, providing needed comfort when carrying heavy loads. The entire bag is covered in padded black nylon. The straps are also well-padded, with easy to reach, thumb-sized hard plastic loops for tightening once strapped on. There are two handles at the top of the backpack, one of which is a quarter-inch twisted metal cable encased in plastic tubing. Yes, it’s industrial cable. This rests within a nylon/hard plastic handle. Did I mention this backpack is tough? 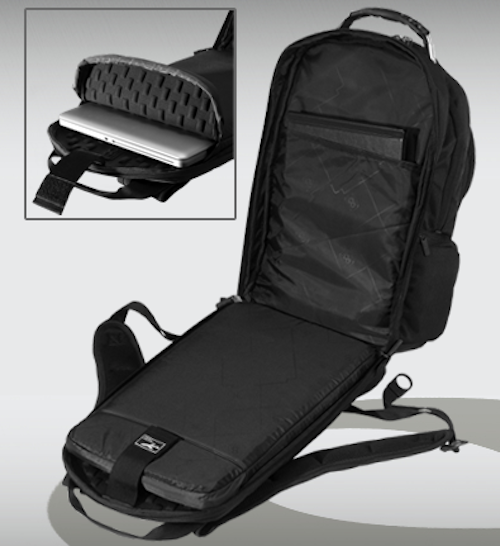 The main compartment of the Atlas Backpack contains a soft neoprene lined pocket custom fitted for either a 15″ or 17″ MacBook Pro. 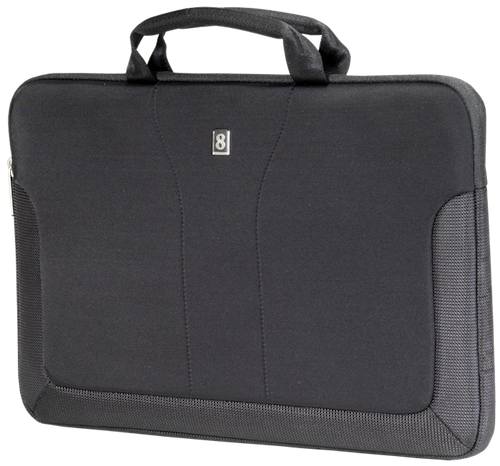 The neoprene does a great job cushioning your laptop. This pocket has a flap held in place with a nylon hook and loop strap that proudly advertises that the bag is TSA checkpoint friendly. This compartment completely unzips and allows you to open your bag up 180-degrees for easy access to your laptop at TSA checkpoints. I use a smaller pocket on the opposite side of this compartment to safely hold my iPad 2. The compartment in front of this is also spacious and offers two padded pockets sized just right for MacBook Pro charging cables. Two divided and one zippered mesh compartments provide storage room for equipment that’s still in plain sight. I use this compartment to store my iPad keyboard dock without fear of it being damaged. It’s an awkward dock to lug around, but the Atlas does so nicely. This compartment also features a metal-grommeted opening that leads to a smaller compartment in front of it. Conveniently, this small zippered compartment has a pocket perfectly sized for an iPhone or iPod Touch. A hook and loop nylon strap holds the iOS device solidly in place. A rubberized opening to the outside allows you to thread your earbuds through for listening while on the go. The rubberized opening is split into an X, doing a decent job of keeping out dirt and water. 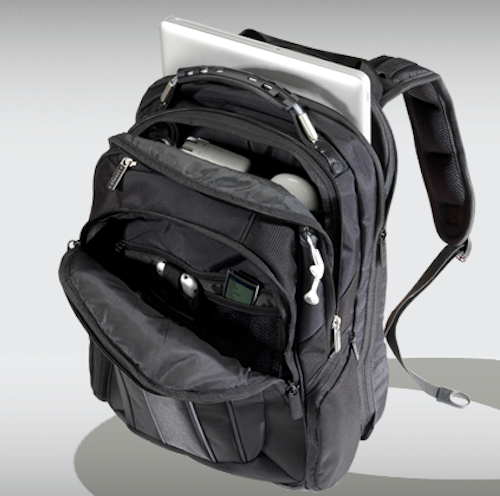 The front compartment of the backpack contains a ton of compartments sized to fit a variety of Apple products. Slots for pens or styluses, 2 pockets for iPhones or iPod Touches, a large zippered pouch, and an elastic mesh compartment hold all sorts of accessories you might need throughout the day. 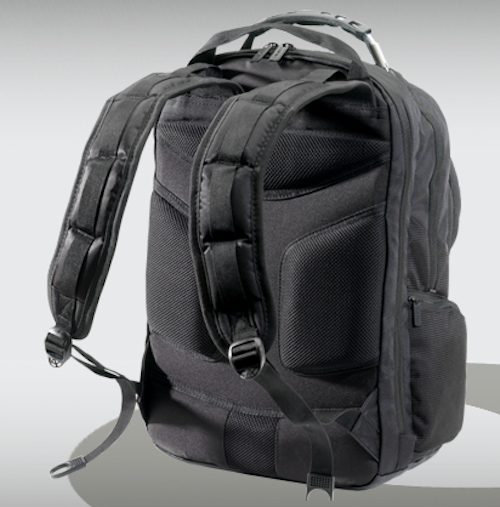 Yes, this backpack is a real bargain at just under $100. The attention to detail is second to none and the fact that it’s custom designed for Apple products puts it over the top in my book. I haven’t forgotten the 15″ Protective Sleeve. It’s built to the same quality standards of its big brother, the Atlas. At $49.99, the sleeve is a more affordable option for those with minimalism in mind. The sleeve is lined with padded neoprene that’s covered with the same raised studs as the Atlas Backpack’s MacBook Pro pocket, providing a great deal of protection for your laptop. Heavy-duty, neoprene and nylon coated handles make carrying the sleeve comfortable as well. A second zippered compartment lies atop the main compartment for storing charging cables and other accessories. I use this bag to bring my MacBook Pro back and forth between meetings while at school. The sleeve works great and hasn’t shown a bit of wear and tear yet. I can’t say enough in praise of Level8’s Atlas BackPack and Protective Sleeves. They’re the perfect choices for any Apple fan and are built to the same exacting standards we’re accustomed to with Apple’s products. Grab one today at Apple.com or at your nearest Apple Store. You won’t regret it.